July 1 is a big day – this is the day the plastic bag ban will take effect in Seattle, Washington. The ban was passed back in December and it has an impact on all stores from small mom and pop ventures to large retail chains. There are still some folks who disagree with the ban and there continue to be small movements to overturn the law. Most of the anti-ban groups are either financed by plastic bag manufacturers or residents upset that the law was voted in by the city council and never went before the people. Shortly after the ban was voted in there was a petition to get the issue on a ballet so the people of Seattle could decide on the matter; however this grassroots movement failed to get enough signatures for the plastic bag ban to go to a city wide vote. Overall the general mood among Seattle residents is that this is the right thing to do. So many plastic bags are used and are not properly disposed of and bags end up littering waterways and causing environmental harm. The City has been working hard to make sure all stores are on board and ready to go come July 1. In addition to sending out 10,000 fliers explaining the ins and outs of the law to local businesses, they have also made phone calls and in person visits and have even employed translators to ensure the lines of communication are crystal clear when working with ethnic stores in which English may not be the primary language for many of the staff and shoppers. This outreach appears to be needed and is greatly benefitting the community since many stores have had questions, such as what do they do with any remaining plastic bag inventory they have as of July 1? Under the law stores are allowed to use up their inventory – they just cannot add to their inventory. The city has also suggested that larger chains which have stores in locations not impacted by a ban should consider sending any plastic bags they have to their sister stores to help expedite the transition and eliminate confusion. Seattle’s ban also allows plastic bags to continue to be used to when carrying cleaning products or items that are prone to leak, like ice cream. The Seattle Public Utilities (SPU) have also created a web page dedicated to educating visitors about the ban and encouraging reusable bags instead of plastic. The site lists what the ban will achieve, exemptions to the law, alternatives to plastic bags and tips for shoppers, as well as a phone number for residents to call to report stores that are not adhering to the law after the ban goes into effect. Overall, the city is making a great effort to make the law a seamless transition and as easy as possible for shoppers and businesses. Many shoppers have decided to get ahead of the law and start bringing their own reusable bags when the shop. 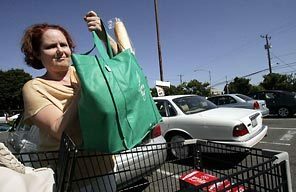 Tony d’Onofrio of Town and Country Markets in Seattle estimates that about 30 percent of his customers currently bring reusable bags. Once the ban officially begins d’Onofrio said they would give customers who bring their own reusable bags 5 cents off for each bag they bring, to incentivize shoppers to go the reusable route instead of using paper bags, which will incur a 5-cent charge starting on July 1. “Seattle has a strong environmental identity. As part of Seattle and the local community, this is in our DNA,” said Theron Andrews, vice president of marketing for Bartell Drugs, which has 19 stores in Seattle. This support from the stores and community will help make the changeover from plastic to reusable wine totes and reusable bags as smooth and easy as possible. Bartell Drugs has been phasing out plastic bags and stocking up on paper bags. In a smart and classy move Bartell Drugs has also commissioned local artists to design artwork for two reusable bags which will be sold in their stores. One bag will feature a Washington theme, and the other will draw inspiration from Seattle. This is a great way to support the law, encourage a sense of pride and community, promote their business and help the environment. This is an exciting time for Seattle and hopefully all of their hard work pays off come July 1. Read up on Seattle’s ban at http://www.seattletimes.com/seattle-news/plastic-bag-ban-catches-some-seattle-shoppers-by-surprise/ and http://komonews.com/news/local/shoppers-store-owners-get-ready-for-plastic-bag-ban and head over to the Seattle Public Utilities page at http://www.seattle.gov/util/MyServices/Recycling/ReduceReuse/PlasticBagBan/.